If you are looking for information on the Subway franchise business opportunity, Subway franchises or Subway franchising, then you have come to the right place. At Doctor's Associates Inc. (DAI), we take great pride in the exceptional franchise opportunity we offer. We strive to provide our franchisees with the tools and knowledge to run a great local business, and we encourage owners to learn the skills that will allow them to own and operate multiple locations. 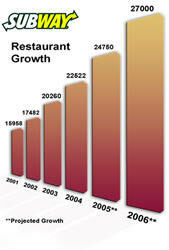 More than 26,000 restaurants operating in over 80 countries. Number 1 in the United States for over a decade. Number 1 in restaurant counts in 1 out of 7 countries we're in. What gives the SUBWAY® franchise system the edge in the sandwich category? Great food. Our varied menu selection provides customers with endless options. Simplicity. We have an easy-to-run operation. Support. We have systems in place to assist our franchisees. Control. We teach owners to use exceptional control methods to help them run their business efficiently. The SUBWAY® franchise system is a strong and growing brand that's known for great tasting sandwiches that are a healthier alternative to traditionally fatty fast food. Why are the sandwiches so good? Bread baked on premises. Every restaurant bakes its own pre-frozen bread daily. Gourmet sandwiches. The flavored breads and select sauces taste delicious. Made to order. Each sandwich is made to order in front of the customer. At DAI we work very closely with our franchisees. There are support structures in place to assist franchisees with their advertising, supply ordering and other operational needs. We have a great organization, and if you are interested in bringing the SUBWAY® franchise system to your area or town, we would love to speak to you about the SUBWAY® system. With the SUBWAY® franchise system's outstanding support and operational history, it's no surprise that it continues to break records. Having the highest number of restaurants in the United States and over 3000 international locations is a true testament to the growing popularity of the SUBWAY® franchise. Investigate. Do your homework - check out the numbers, check out our restaurants, meet our franchisees, and consider this - more than 70% of new SUBWAY® franchises are sold to existing owners. That should say it all.